There's nothing better than competing in front of your home crowd. It's even better when it is the final UCI cyclocross race of the season! The Resolution Cross Cup has steadily cemented itself as a staple of the late season calendar. Offering a warm climate, miles of country roads, and lots of southern hospitality, it's a wonder more folks aren't making their way to Dallas each December. In any case, I think most people are starting to realize, the course and the event as a whole isn't one to miss! After recovering from Ruts N Guts, it was back home to local roads to prepare for the last UCI race of the year. I had been looking forward to the 2017 edition of the Resolution Cross Cup all year. For one, it is a course that I know like the back of my hand, having trained in the woods and in the park since the middle of the summer. But more importantly, this race offers a chance to compete with some of the best riders in the country in front of some friends and family. While my season as a whole has been improved from years past, I came into the week hoping to put it all together at the 2017 finale. To whet my appetite for the race, I headed out to the Creek Cross cyclocross series on Wednesday night. This local race series has been going on as long as I have lived here in Dallas, and it's a great way for riders of all levels to practice their skills and just have some midweek fun! 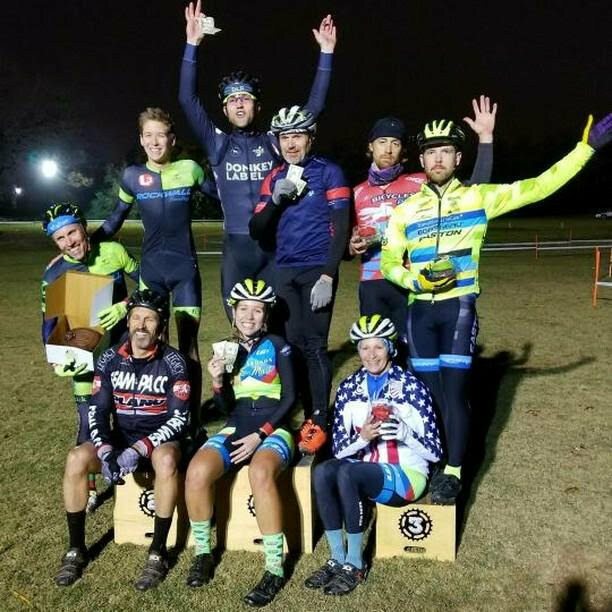 Being that it was the final weeknight race of the year, there were a few special events planned, namely the Cyclocross Madison race. A few pros also joined the fun, like Rebecca Gross and Tobin Ortenblad. The madison race was a ton of fun, with riders sprinting through the sand and taking hot laps on the course with beaming smiles across their faces. Our team was a bit unlucky and ended up third in the event. But at least there were cupcakes! The night ended with the A race and it was a good time chasing Tobin around the track. He and I would try to ride the uphill sand each lap while taking a marshmallow hand up before remounting. Of course, Tobin won - both the race and the marshmallow eating competition - but it was a blast riding behind arguably the best rider of 2017. The course contained many similar elements to previous editions. Held in Winters Park Amphitheater in Garland, Texas, the course designers make great use of the dragging uphill and the surrounding woods. This year's track was no different with some technical turns in the woods, a long uphill sandpit, and many sections of hard pedaling. The weather was a perfect 60F and abundant sunshine - see what you're missing out on?! - and spirits were high as we rolled to the line. I landed on the second row of the grid and lined myself up behind Scott Smith (JAM/NCC). My preparation leading into the race had been good, I liked the course, and my mental focus was spot on. All that was left to do was put it all together in the race. The whistle blew and my right foot instinctively shot towards my right pedal but as I went to complete the clip in process, my foot rolled right over the pedal. From second row to DFL I went. I tried to keep my panic in check and get back on the gas once I was clipped in. The first corners were hectic, with some pushing, some shoving, and some chopping. I stayed patient and chose my spots to start moving up in the field. By the end of the first lap, I had improved my spot slightly, but still had work to do. Each lap I would gain a little more ground and pick up another spot or two. The twisting nature of the lower portion of the course put a speed limit on how fast one could go. While I was making time in the flat pedaling sections, I couldn't make up much more than a half second or two on the rider in front of me. Each time I crossed the line I was willing my legs to go a bit harder, and each lap I kept pushing to ride both the uphill sand section and the uphill ride up/ run up in the woods. I was never successful at either, but the challenge was inspiring for my tired legs and lungs. I was locked in a battle for a spot inside the top 20. Try as I may to shake my competition, it wasn't until the final lap that I was able to make some headway and could pry some daylight. That effort landed me 16th place and some tired legs. Sunday was a new day and the skies again were bursting at the seams with sunshine. A nice night with the team had worn away the frustrations of Saturday's race and I was mentally ready to go. The course was reversed from Saturday and as I took my pre-ride laps, I was feeling pretty good about the flow of the track. Then I got to the woods. A telltale sign that something is pretty rad, is when riders are all standing in close proximity eyeing the feature. Sunday's course included one such feature. As I entered the woods, I noticed a sign that read "Pros Left. You Right". Perhaps I should have turned right because as I rolled to where my fellow elite racers were, my eyes were met with a GNARLY drop. The feature was definitely rideable but it was steep! Mustering up the courage, I took a few runs down the steep embankment and called it good, hoping that my good fortune would continue for the entirety of the race. The Pro Only section was the talk of the town, as spectators gathered to watch riders attempt to navigate the slippery slope. As we waited on the line for our start, Jeremy Powers (Aspire Racing), the boss of the peloton, reminded us, "How about we all take it easy on the drop on the first lap guys? We all know it's gnarly, so let's not be jumping on top of each other." Nuff said. I again assumed my spot on the second row of the grid and stood poised to put it all together today. The whistle blew and I again missed my pedal. While I didn't roll over it like the day before, it took me a second or two to get clipped in. I was more aggressive and pushed my way through a few gaps to get back to the front of the bunch. We entered the (now downhill) sandpit and there were riders everywhere. I escaped without a face full of sand and used my exit speed to pick up a few more spots. I wasn't at the front just yet, but I was moving in the right direction. We passed the pit for the second time of the first lap, and I remained patient as we entered the woods. With so many bodies, I elected to dismount and run the UCI Drop, remounting for the final climb out of the woods. Just as I got ready to punch it over the roller, I hit a root and heard the familiar hissing of a flat tire. I secretly hoped that it was not my wheel, but all my wishing was for not. I quickly dismounted my bike and began my long jog to the pits. With half the track left to cover it wasn't long before I found myself at the back of the race. I tried to pedal my bike in some sections to limit my losses, but you can't really corner well on a flat front tire. When I made it back to the pits and hopped on my B bike, I was 1:30 down on the last place rider. Option 2 - Make the most of the situation. Now, I am under no illusions of having Spencer Petrov or Stephen Hyde level power at this point in my development, but seeing those guys bounce back through similar misfortunes (Petrov at the Pan-Am Championships & Hyde at the World Cup in Denmark) was an inspiration to me in that moment keep pushing. Moreover, I was presented with a situation where there was nothing to lose and everything to gain. I was already last place by some margin and there was nowhere to go but forward..
A fire was lit and I started to mash on the pedals with twinges of desperation and anger. "You had a flat. You're off the back. The only place to go is forward." I repeated this to myself until I was finally over it (getting a flat) and making up ground. Each open section I flicked down a gear or two and sprinted up to speed, each time pedaling as hard as my body and the course would allow to gain fractions of a second. The laps ticked down and I was still wrestling to make up spots. Riders, worn from the early battles of the race, were coming closer, but time was running out. I was fortunate to have one of my coaches there, Mario Arroyave of Utmost Performance. Each time I passed him he reminded me to ride "Your best." It seems so simple, but it was a great reminder to keep riding each lap, each section, each turn as fast as I could in that moment. I pushed hard to pick off as many people as I could, but eventually the real estate ran out and I crossed the line in 25th place. Thanks for reading and everyone have an awesome ride!